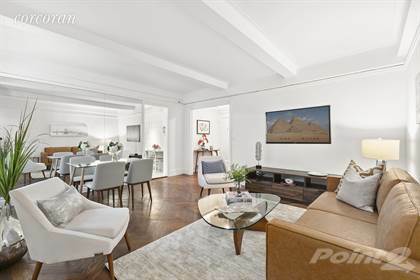 "This elegant and gracious pre war 1 bedroom, West of 3rd Avenue is an excellent value. Enter this home through a lovely entry foyer with coat closet that leads to a large Living Room with high ceilings and herringbone floors. There is ample room for dining and the kitchen can be opened to create a more contemporary living space. The windowed kitchen catches the south light in morning and afternoon and has room for an eat in kitchen or dining counter. The building allows washer dryers in the unit and there is plenty of room in the kitchen to include one. The spacious Master Bedroom has northern exposures over East 81st Street. The windowed bath is off the main hallway with utility closet just outside. Overall, this unit has a warmth and elegance typically found in pre-war homes. Seller is negotiable and will consider serious offers from qualified purchasers. 140 East 81st Street is a sound and well-maintained coop, located on a lovely tree-lined block on the corner of Lexington Avenue. The full service building features a live in super, new fitness room, patio for residents, laundry room and common storage. The building maintains excellent financials, no flip tax and bulk cable and electric reduce utility costs. Pied-a-terres, washer/dryers and one pet are permitted with board approval. " Hi, I'd like to find out more information about 140 East 81st Street. Thanks so much!